Silk body lotion by BINGOSPA. It has a light and fluffy formula that absorbs quickly. Perfect for even the most sensitive skin. Thanks to specially selected ingredients, e.g. extract from Noni, sea algae and olives, comprehensively moisturizes, nourishes and cares. After applying, the skin's condition improves - it gains flexibility, softness, smoothness and a youthful appearance. In addition, it neutralizes free radicals and delays the aging process of the skin. It leaves a pleasant and delicate aroma. It gives the skin velvet softness and smoothness. 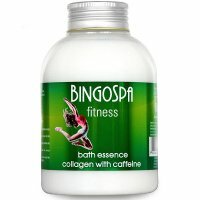 Effectively slows down the aging process of the skin. It has a light and silky texture that absorbs quickly.